This is a story of innocence lost. It is also a story of hope. Five years ago, when I moved to Thailand, Tawn’s father established a “don’t ask, don’t tell” policy with regards to me. He acknowledges that I exist as a part of Tawn’s life, but he doesn’t want to know anything more about me and he doesn’t want me involved with his life. I’ve made my peace with that. The story of hope is that while Tawn’s father isn’t warm and cuddly towards me, plenty of other members of his family have been. Over the eleven years we have been together, Tawn has introduced me to many of his relatives and I’m friends with what seems like half his cousins on Facebook. Of all these relatives, one family in particular – an aunt and uncle in Los Angeles and their three sons – have been particularly welcoming, ever since Tawn first brought me to dinner with them some eight or nine years ago. I keep up with those cousins, their wives, and children (who are about the same age as my eldest niece) as regularly as I do the cousins on my side of the family. Especially with regards to the joys and challenges of parenting, I follow along, offer my support and encouragement, and laugh at the pearls of unvarnished truth that tumble out of their children’s mouths. And that is where this is a story of innocence lost. One of these “first cousins once removed” is eight-year-old Jessica. She’s just a little too sharp for her own good and is ceasing to believe in the things that make childhood such a magical time. On Sunday, Jessica lost a tooth. As her father tells it, before she went to bed she started questioning the existence of the Tooth Fairy. Last November when she lost a few teeth, she wrote a note to the Tooth Fairy asking for a photo of her. Thankfully, her father explains, the Tooth Fairy produced the evidence in a future visit. When Jessica’s father went to look under her pillow Sunday night, he found this note asking the Tooth Fairy to sign her name in receipt of the tooth. So while I get the joy of being a part of Tawn’s extended family, it seems that at least one of them is growing a bit cynical with age. And it isn’t Tawn’s father I’m talking about. This entry was posted in Uncategorized and tagged children, Cousins, Fairy, family, Innocence, Tawn, Tooth by christao408. Bookmark the permalink. hahaha wow, if she’s willing to do that to the tooth fairy, i can’t imagine what she makes santa do for his milk and cookies! Lawyer… definitely going to be a lawyer. Haha, she should go into research!! !Okay, I just have to ask… Does she mean the sixth tooth for the fairy? Or is she actually referring to tooth #6? Now that would be the sharpest 8-year-old I know if it’s the latter. BTW, I’ve had a little discussion with Sugi regarding this… I didn’t really grow up with the concept of tooth fairy or Santa Claus. And I wonder how I would raise my kid(s). Have them believe in something magical and then give them the truth or just keep it real from the beginning? Kids are so smart. I’m a first generation Asian American who grew up in the states in the 1980’s and had to learn it the hard way that those magicial messengers exist only in our imagination. I would write countless letters to Santa with my reply and put tooth under my pillow without a visit from the tooth fairy. So when my little cousin first lost his tooth (he was about 5 or 6) a few years ago, I really wanted to relive my childhood through him and told his parents I would slip the money for him. I put money in an envelope for him and wrote on it “To: Eric From: The Tooth Fairy.” He was only in kindergarden so I didn’t think he would pay attention to my handwriting. Later that week he goes “Thank you for my tooth fairy money. I know you are my tooth fairy because it’s your handwriting on the envelope.” hahahaha LOL I guess he noticed it. I had to make up some excuse about finding the money and putting it an envelope for him. Haha, do I detect a slight outline of a picture she drew of herself? I hope the parents hang on to these things. Remember the letter to Santa that I found? It also had letters from my brother and sister. I framed it for them as their Christmas gift. You should have seen their stunned looks. I’m also glad that so many of Tawn’s family are supportive and welcoming. I hope you continue to play a role as their wise, supportive and benevolent uncle. all i can say is.. what a smart little girl XD@Sinful_Sundae – same! The note is just so cute, with the handwriting!! Haha that kid has got a very bright future! Update: Jessica’s father responded to her earlier request of the tooth fairy that she present a picture of herself by printing up this picture. @yang1815 – In answer to your question, yes the receipt is specifically for the sixth tooth she has left for the fairy. Itemized receipt – too funny! @yang1815 – @Sinful_Sundae – @iskrak – So, this raises the question (which I’ve thought about, too): how would you raise your children? Should they believe in these admittedly magical untruths? @CurryPuffy – It looks like Tawn’s handwriting, actually! LOL@ElusiveWords – Oh, I bet those framed letters were perfect gifts for your brother and sister! How thoughtful of you. @Roadlesstaken – You do. And when I first saw the picture I thought of the spy novel trick I’ve seen in countless movies where you lightly rub pencil on a piece of paper to detect what has been written on the pad previously! @XXKimPossibleXX – What a benevolent heart to play the role of tooth fairy for your younger cousin! So funny that he figured you out so quickly. @Passionflwr86 – Did they not teach you those stories because of religious reasons? @TheCheshireGrins – What age were you when you started to question the Tooth Fairy, Santa Clause, etc? I’m trying to remember and I have to imagine it was somewhere around 8 or 9 years old. Surely by age 10 I had wised up. @marc11864 – Not just a lawyer, Marc. A trial lawyer! LOL@kunhuo42 – She probably doesn’t let Santa have cookies and leaves him only celery sticks. That would be my guess! 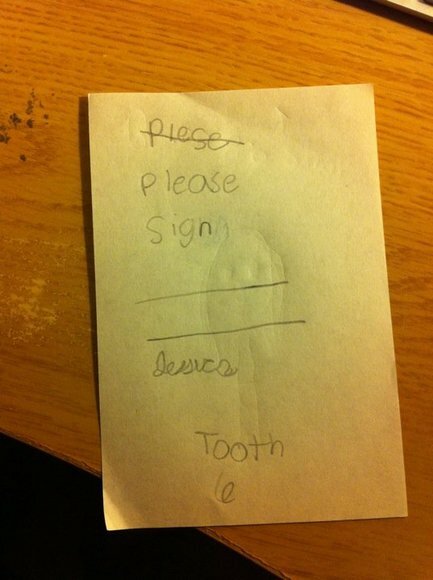 @stepaside_loser – I’m sure her parents will tuck that piece of paper away for when she’s older. It will be a precious memento of her childhood. @christao408 – I feel like I was probably 9. @ Chris… Probably it was for religious reasons, yeah. I never really thought to ask, because it was never deviated from. :shrug: At least I didn’t have to “un-learn” it. I kept the magic going as long as I could for my kids. I never admitted one way or the other that there wasn’t an Easter Bunny or Santa Claus or Tooth Fairy. They grew out of childhood on their own. It’s a shame to see the “magic” disappear. hahahaa i just saw the pix her daddy printed out. muhahahaa this is so funny. thanx 4 putting a smile on my face 2day chris. just found out today that we have a new ceo… and things r just crazy at work. this is exactly what i need today. thank u for sharing. That indeed is precocious. This is exactly what Saadia had done too. So I had to type a letter and put it under her pillow, stating that fairies cannot take pictures on the camera, because every time they do, the camera lens breaks. She was amazed at that answer… and was satisfied. The whole town heard about the fairies and their problem with picture taking. @ZSA_MD – That’s a clever answer! @Sinful_Sundae – You’re very welcome. @agmhkg – Oh, that’s an understatement! @rudyhou – Red envelopes – something to truly believe in! @icepearlz – Oh, it’s always the brother who wants to pop the magic bubble! @peacefulmeadow – Good for you, keeping it going for as long as possible! @murisopsis – I do sense that she wants to believe, despite growing evidence against it. @yang1815 – That should make for a memorable childhood: “Here is a commercialized holiday where we will give you presents…” Ha ha! Well, I never had kids, but I’m not sure I’d have done the Santa and tooth fairy thing. I’m torn between the ‘magic’ for kids and the fact that, at the end of the day – I’d be lying to them, then when they are older I’d be telling ‘them’ off if they lied to me. It’s a question of ‘teaching by example’. @christao408 – That’s right! That’s pretty much what kids nowaday know anyways, holidays = presents. @Chatamanda – That’s a strong argument in favor of not playing into the myths of Santa Claus, the Easter Bunny, etc. @yang1815 – Weird. I never grew up believing in Santa or the Tooth Fairy either. I just played along with the idea when all the other kids would talk about it.Nice post Chris. I like this child!!! @kenpcho – Why play along? Burst their magical bubbles one by one! @kenpcho – Glad you liked it.